Today, June 30, 2013, is the last scheduled day of the Currents 2013: Santa Fe International New Media Festival. The "collection" project was selected for inclusion as a web based art work featured in the festival. This blog post is about social media’s use between the “collection” project and the time period of the festival. The writing will refer to the use of social media to initiate participant engagement with themes of the collection, rather than use as a marketing tool for the announcement of inclusion in the new media festival. Screen Shot from Currents 2013 Facebook Page with website link. The two main sources of social media are Google+ and Facebook. Each of these sources has a Currents: Santa Fe International New Media Festival page to display the artist projects, the events, and the exhibitions at the festival. The posting of the link to the “collections” project website on the pages was done by the festival’s staff. The time period of the posts began weeks before the opening date of the two week festival. These posts related to introducing the artists and projects. 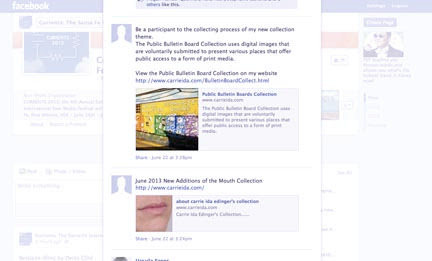 The two posts that were made public to the followers of the new media festival pages were the June 2013 recent addition of the Mouth Collection and an invitation to be a participant of the collecting process for the Public Bulletin Board Collection. Currently, there have been no images submitted during the Currents 2013 festival time period for the Public Bulletin Board Collection. The Current’s Internet pages exist and have longevity beyond the time frame of the site-specific locations of the festival’s exhibitions and offer other opportunities to participate in the project. Screen Shot of my comment with links to the Collections website. The images with this blog post are screen shots of the social media features that were described. This is just as a visual note: it is very unclear to me why on Facebook the collection icon from my Facebook collection page did not display when I posted a comment on the Currents festival Facebook page. I will monitor if the visual of my avatar reappears with future posts. The experiences with the festival’s social media sites are some of the first to be documented as “online” engagement with the “collection” project through a site-specific event.